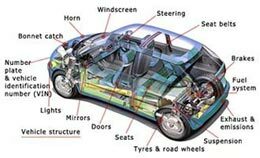 • The body and vehicle structure is free from excessive corrosion or damage in specific areas and there are no sharp edges likely to cause injury. • The fuel system has no leaks and the fuel cap fastens and seals securely. The fuel cap will need to be opened so be sure the key is available. • The exhaust meets the requirements for exhaust emissions, depending on the age and fuel type of the vehicle. • The exhaust system is secure, complete, without serious leaks and silences effectively. • Seat belts are checked for type, condition, operation and security. All compulsory seat belts must be in place. • Seats are secure. Front and rear backseats can be secured in the upright position. • Doors latch securely in closed position. Front doors should open from inside and outside the vehicle. Rear doors may need to be opened to gain access to testable items. • Mirrors are in place, in good condition and secure. • The boot or tailgate can be secured in the closed position. • The brakes are in good condition and the operation and performance (efficiency test) is satisfactory. Note the removal of the road wheels is not part of the test. • The tyres and wheels are in good condition, secure, of the correct size and type and tread depth is sufficient. Spare tyres are not inspected. • The registration plates are in good condition and secure and that the characters are correctly formed and spaced. • The lights are in operational condition and secure. Headlamps are tested for aim. • The bonnet securely latches in the closed position. • Wipers and washers operate to give the driver a clear view ahead. • The windscreen is in good condition and the driver's view of the road is clear. • The horn operates correctly and is of a suitable type. • Steering and suspension are of a satisfactory condition and operation. • The vehicle identification number (VIN) is on vehicles first used on or after 1 August 1980. Not more than one different VIN is displayed except on multistage build vehicles. Call Leyland MOT Test Centre Today On 01772 423 416 or click here to book your next MOT Test online!